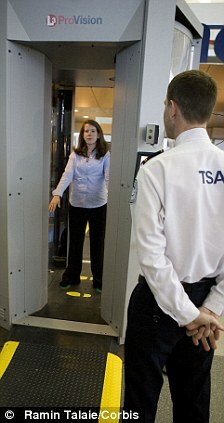 I don’t know if this is true, but I was told yesterday by some TSA inspectors that there would no longer be an “opt-out” option from full-body scanners in Europe. (Anyone know about this?) About to pass through security at Heathrow (British Air) I began the usual strip, including knee brace, which invariably triggers bells. I was told they didn’t want me removing the knee brace “in public”, so I went through the machine, it went off, and I was given a pat down and told I also had to go through the full-body scanner which I always opt out of (not that it has often arisen). They usually grab a bullhorn and yell out loudly “female opt out!” in order to signal the need for a non-male TSA rep to do the pat down. This time, however, they told me there had just a few days ago been a change of rules in Europe, and there was no opting out (if selected). After I argued for several minutes that neither the safety nor the effectiveness of the full-body scan had passed severe tests, I suddenly found myself surrounded by 4 male TS officials who said I either go through the full-body scanner or not fly. I received a form in which to write my complaint to the authorities. After I submitted to their invasion of privacy, they still demanded I take the brace off—I guess it was ok to perform in public now. Any females with similar experiences?